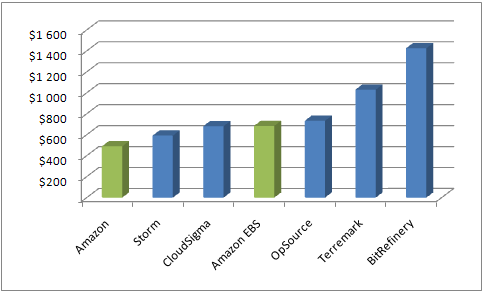 Cloudorado Blog: Is Amazon the cheapest cloud computing provider? Cloud Computing Myth Busters! Is Amazon the cheapest cloud computing provider? Cloud Computing Myth Busters! When people think of cloud computing, they almost automatically think of Amazon EC2. Amazon has become the cloud computing company and is commonly perceived as the cheapest, if not the only, IaaS provider. But is this really so? Let’s play Myth Busters as on the Discovery Channel. Cloud Computing Myth Busters! We will compare all of Amazon’s instances from Standard line with prices for cloud servers of at least the same parameters from other cloud computing providers. For this purpose we will use Cloudorado - the cloud computing price comparison engine. For Amazon to be considered the cheapest, it would have to be the cheapest for every instance type they provide, since these are their strongest points. If this is not met, there is no point in checking any further. We will assume only cloud server costs. No transfer, licenses or load balancers. We will choose a full month of computing with on-demand prices. We could expand it to other instance types and other combinations, but there's no need to drag this article out with too many variations when you could easily try them on your own with the cloud hosting price comparison engine. We will also provide one extension to Cloudorado calculations. As Amazon does not have persistent instance storage as other providers, we will also provide additional calculation of instances with a persistent EBS storage of equal size to instance storage. Unfortunately the cost of the EBS service depends on both size and number of I/O requests. As an estimate of I/O requests cost, we will use 100 I/O per second, resulting in $26 per month as indicated by Amazon in Projecting Costs section of EBS description. OK, with all assumptions explained, let’s start! 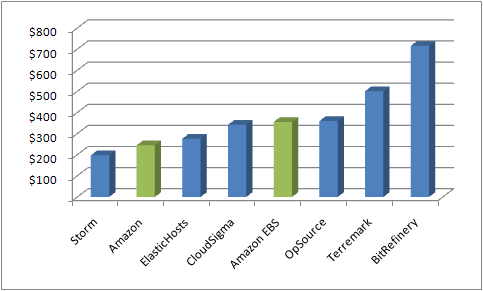 Amazon was second, just 60 cents more expensive than ElasticHosts. But the instance with the persistent storage was 70% more expensive than the winner. Amazon is again second but this time 24% more expensive than Storm. Amazon with persistent storage was 80% more expensive! Finally, Amazon is the cheapest! It is 21% cheaper than Storm, which had all resources more than doubled. But Amazon with persistent storage was 16% more expensive than Storm. What? But there is no Standard Medium instance! You are right. We just wanted to show what happens if requirements go outside of Amazon space. Amazon does not have any instance between 1.7 GB RAM and 7 GB RAM. Standard Medium would be an instance twice as big as Standard Small – 3.4 GB RAM. 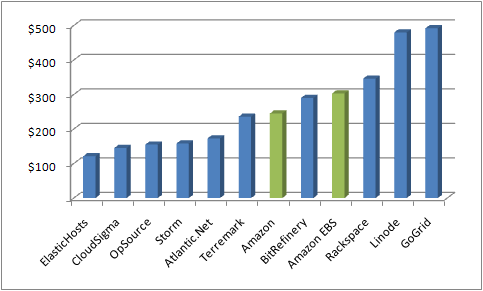 Amazon gets 7th position, being twice as expensive as the winner – ElasticHosts. Amazon with persistent storage is 150% more expensive than ElasticHosts. Myth Busted! 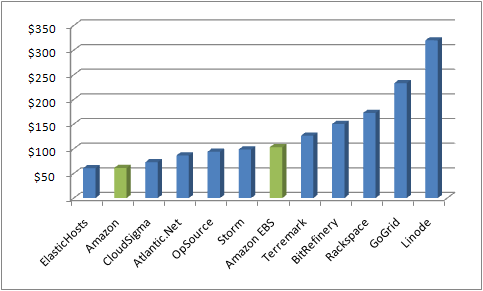 Amazon is not universally the cheapest cloud computing provider. Even with requirements perfectly matching Standard instance types, Amazon was the cheapest only once! It was once almost the cheapest and once 24% more expensive than the cheapest provider. With the persistent storage option (EBS), Amazon was never the cheapest, costing on average 55% more than the winner. It gets even worse if you get away from Amazon’s instance types, where we showed an example of Amazon being twice as expensive, but it can be much worse. So always be sure to compare cloud computing prices for your specific needs. Don’t fall for myths that any given provider always offers the best deal. Rackspace Cloud are cool people tho, love them for the support more than anything else (and I can manage my servers myself)..
1and1 also offers cloud hosting that is pretty affordable. Your Linode price for the small instance is way way way off. They don't sell a "small instance" in exactly that configuration but you can get something comparable for $60 a month, bringing it into the top 3. Any of mentioned here - Linode, Rackspace or 1and1 (need to add this one) will have their space where they provide the best offer. But it is really, really dependent on needed resource size, their proportion, plan you are willing to commit to, etc. Depending on that they can be either first or last. The result of the article if true for any provider - you always need to check. Hopefully with Cloudorado it is going to easier. Did you take Amazon's reserved instances into account? The post assumed on-demand prices. But check reserved instances go to www.cloudorado.com and specify the subscription duration you are interested in. In default mode it has to be expanded below the sliders; in advanced it is first parameter on the top. For me, Rackspace offers good and affordable (but it still depends on the wants or desire of the company) cloud hosting or anything with regards to clouds. They provide robust products to the customer.